...let's find out what we have to do. Ready for a fun popcorn science fair project? Which method of popping popcorn is best? This is a good question because we can try it out in our kitchen. Don't forget to ask for help from an adult before you use the kitchen. But don't try it yet. We need to answer our important question first! Which kind will be better? Write it down on a piece of paper. Don't change it until you see what the experiment does first. We call this guess our hypothesis. ...let's experiment! Measure (I said measure!) out the exact same amount of popcorn for the hot air popper and the stove top. Have your parents help you with how much to pop and read the label on the jar of popcorn for cooking instructions. Cook each "batch" of popcorn separately. Use a chronograph (many cell phones have one) or a clock with a second hand to keep track of when you hear the first pop. Write down the time so you can keep track of it. Also, write down the total time it took for each method to stop popping. You may want to make a chart to help you keep track of the times. Make one chart for each kind. Now, check the fluffiness and texture of each kind. Which one looks better? Set up a taste test with your family to find out which tastes better. 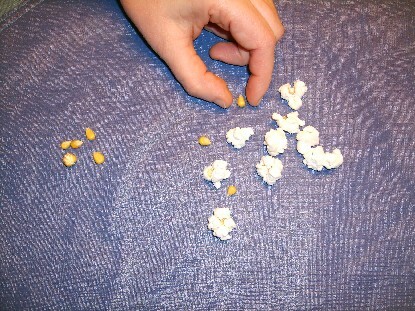 Don't forget to take lots of pictures of the popping and the counting for your popcorn science fair project. (Your family [especially your sister] may not appreciate you taking pictures of them eating though!) Pictures show you did your own work. The bowls may be hot and could hurt you. This is why you must have an adult with you at all times for this popcorn science fair project! 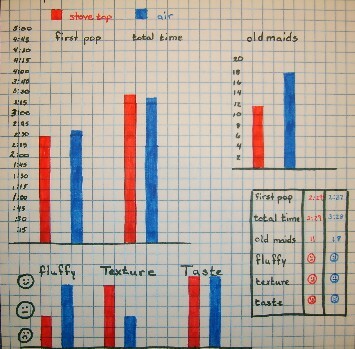 ...let's make the graph for the popcorn science fair project! 1. What you guessed about the popcorn. 2. What you did with the popcorn. 3. Which popcorn popped the best. 4. If your guess was correct about the popcorn experiment. Be careful to obey all the school rules for your science fair report. One or two paragraphs for each grade level will do if you weren't given how long it should be. 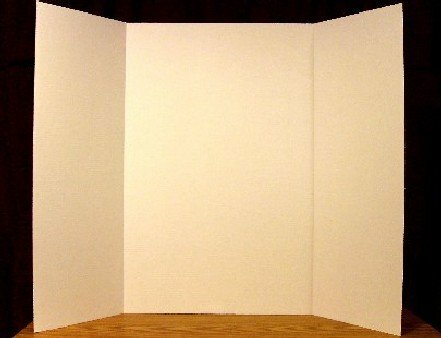 Now you get to make the display for your popcorn science fair project! If you want to get some ideas for your display we have some examples for you. Just click here for examples of displays for your popcorn science fair project that you might want to use. Whatever you do, have fun with this popcorn science fair project!